I went to Potfest in the Park this weekend. 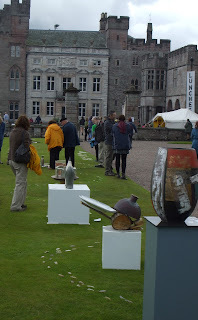 103 potters were gathered in marquees in front of the castle at Hutton-in-the-Forest, near Penrith in Cumbria. They came from all over the world - Holland, Germany, Belgium, France, Italy, Poland, Japan and the UK. It is wonderful that they were prepared to travel so far – nearly as far north in England as you can get - to show their work. 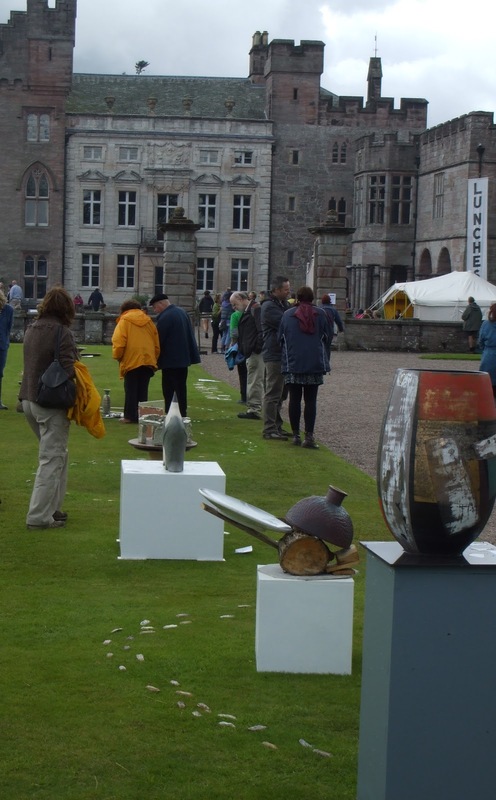 All the exhibitors I spoke to were incredibly passionate their work – it was really inspiring to speak to so many potters in one day! They all had very distinctive styles of working with the same material. That is why I love working with clay so much. You start with a lump of clay and really the possibilities are endless. There is a second Potfest event next weekend. If you find yourself in North-West England, I really recommend that you go along. 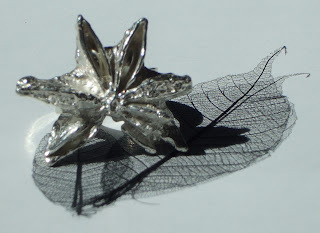 My scrap pot was getting a little full so I decided to do some cast a ring - using a star anise. It is quite heavy, as cast pieces generally are. In fact it is a bit of a knuckle-duster – nobody should mess with me when I’m wearing this ring!! 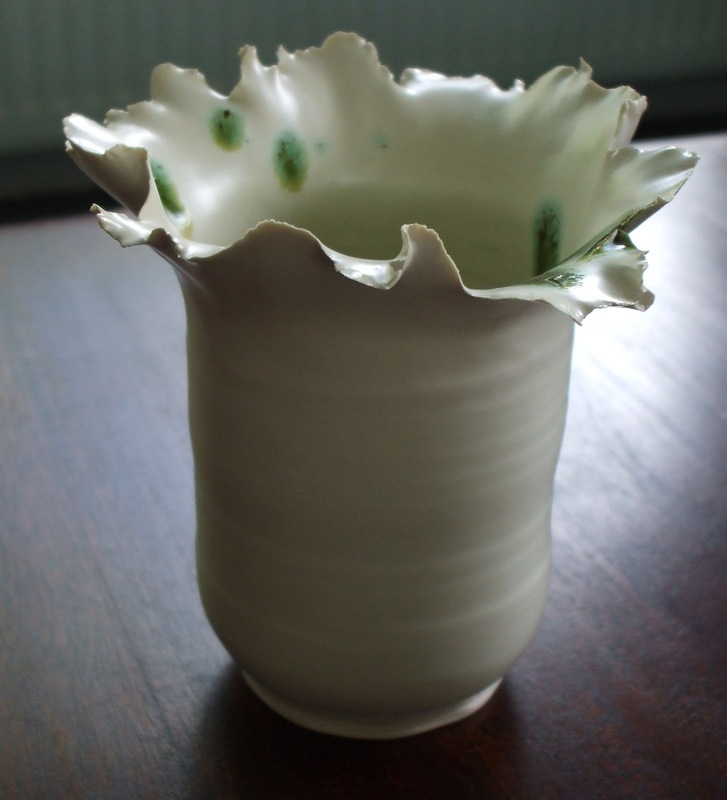 Here are some more photos of my thrown porcelain pots, complete with fluted rims. This one started life as a standard bowl but I had fun with the edges on this one…. I am very keen on this glaze combination. 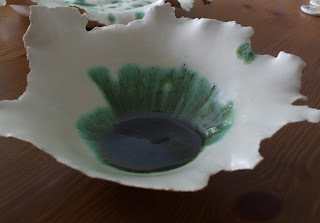 I think it works well with the porcelain – I’ve tested some other glazes but this is what I’m sticking to for the moment. I put the green on quite thick and I love how it turned out. It looks like a dark and still pool of water. Here is a more upright shape…..
I’ve made a silver prong setting for one of my porcelain disks. I like the simplicity of this – I just let the porcelain be the star of the show. It is really easy to wear and seems to catch the eye - I’ve had lots of positive comments about it. I’ll definitely make some more of these. 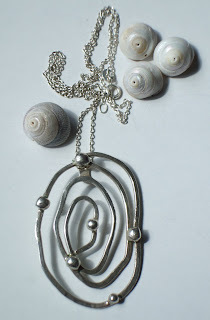 I made this pendant a while ago – in fact it was one of the first silver pieces I ever made. People see different things in this pendant – water flowing, a star constellation, a spider’s web. But a colleague today said it looked like ‘a black hole sucking everything in’. I guess he must have been having a bad day! What do you see? I’ve been throwing pots on a wheel for a while now but this year I’ve started throwing with porcelain. 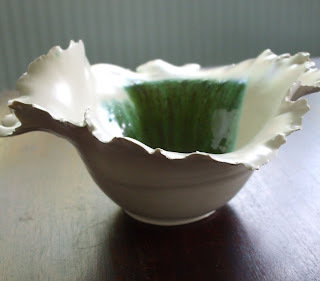 It was challenging at first – it felt like I was learning to throw all over again – because porcelain is much more elastic than the clay I’d been using before. But now that I’ve figured it out, this elasticity is an advantage. I’ve been using it to create thin, fluted rims on my pots – pushing the delicate edges as far as I dare. I like the effect, what do you think? Exciting news……I did my first craft fair at the weekend! It was organised for students of the college where I take a class. It was a little bit daunting but totally thrilling at the same time. 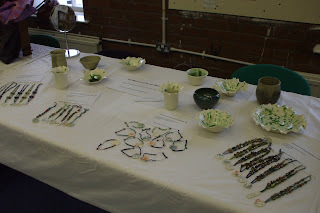 Here’s how my table looked…. 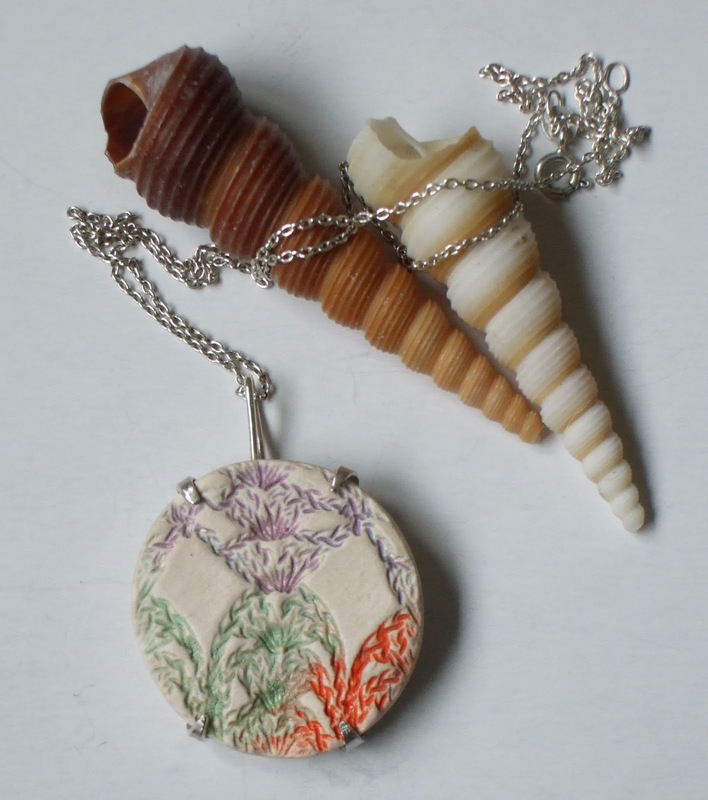 Jewellery making and working with clay has been my hobby for some time now. I beaver away at college or at my kitchen table - and of course friends and family have seen the results (and received these whether they wanted to or not!!) - but it was quite a big step to take my work out for other people to see. It was great to speak to them about my work - and it was a total delight to find how interested they were in it. So I have a decision to make – should I keep this as a hobby or take it a step further? Thank you so much to all the lovely people I met at the fair – I really appreciated all the kind and encouraging comments, they really meant a lot to me.